The official Alabama football website says it's 1 day, 10 hours, 48 minutes and 40 seconds until kickoff of the Alabama-Florida State game. 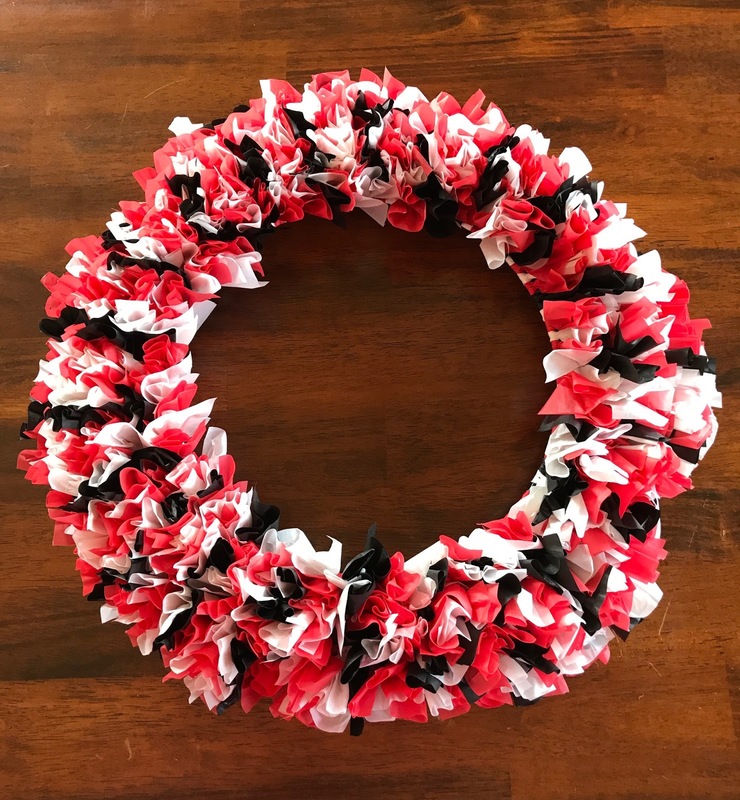 In honor of the official start to football season, I made a red, white and black football wreath for our front door. When I finished I realized it was Ottumwa High School colors too, which is an added bonus! 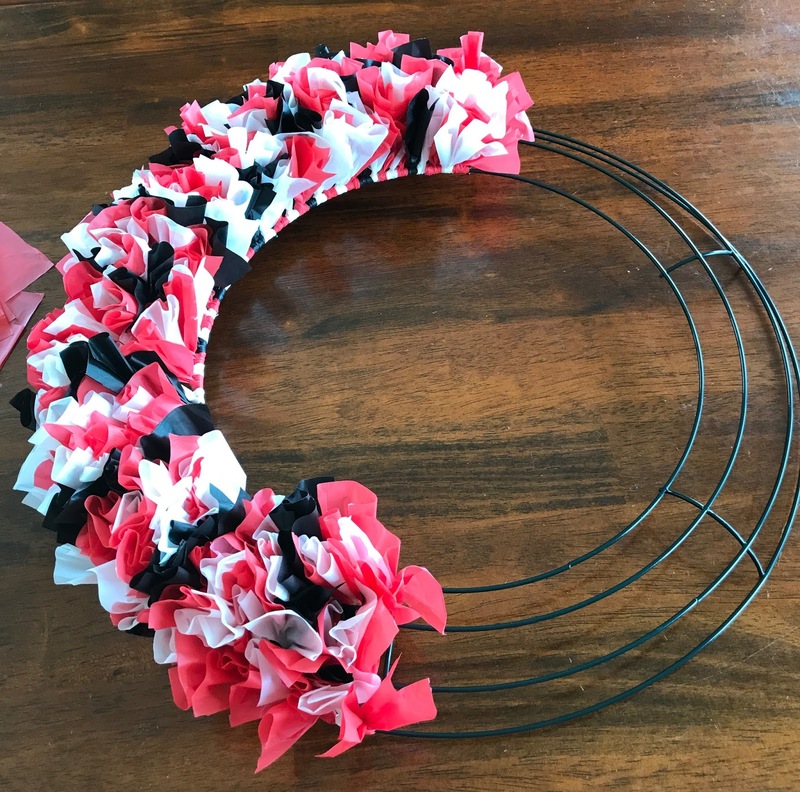 Believe it or not, this wreath is made from strips of plastic from a dollar store table cloth. 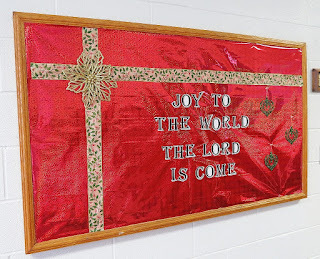 I picked up one in three colors along with a wreath and a football for $5. That and a few hours of labor was well worth it! The 2-inch by 5-inch strips of plastic table cloth are simply looped around the four wires and pulled tight. Tip: be careful not to pull too hard or the plastic will tear. 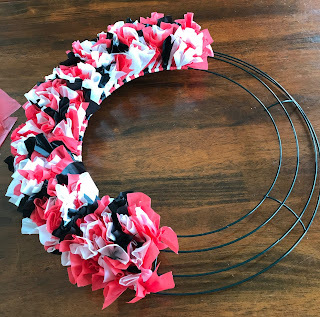 Alternate colors in rows around the wreath. Tip: more colors make the finished product much prettier. Throw in a contrasting color every few rows to break up the monotony. If our store carried gray I would have gotten that one, but the black looks great, too. This is what the back will look like as you work. Tip: straighten the knots as you go by fluffing them and arranging them with your fingers. It's much easier to do it now than when you're all done and they are tightly packed. Here it is half done. This isn't a hurry-up-and-get-it-done project, so every little milestone is worth celebrating! 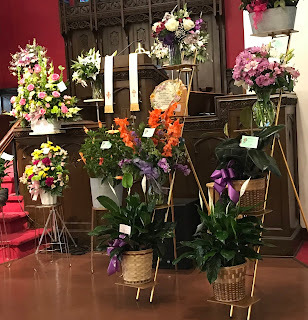 Keep them close together and fluffed to the center. And here it is! I love that the ends aren't all even, but fold and wrap and look a little more fun. I simply attached the football with tape on the back of the wreath. Now we have one more way to celebrate our favorite team - Roll Tide!